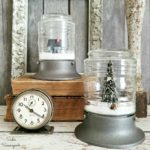 Over the years, Mr. Seasongoods has become accustomed to scanning the curb for interesting “things” that could become blog projects for me- and just a few weeks ago, he came across a pair of these old, beat-up candle holder lanterns. Each one was reminiscent of an old style light post, and he was fairly convinced I could use them- so he loaded them up and drove them home. With Halloween on my mind, I immediately envisioned some outdoor porch décor using the more beat-up light post of the pair. So, I decided to refashion it into a cute and spooky Halloween street sign! This post contains affiliate links for your crafting convenience. To do this, all that we needed to do to the light post was drill holes straight through the post. Using a high-quality unibit and some multi-purpose oil, Mr. Seasongoods very carefully drilled a half-inch hole straight through both sides of the light post. The only alteration we’re making to the light post! Why did I want this? So I could insert a wooden dowel (like this one) and hang a Halloween sign from it! Ok- now I set the light post aside because, for all intents and purposes, it was done and could wait on the porch for me to finish everything else! And here’s where I’m going with my Halloween sign: I had thrifted this cute little chalkboard a long time ago and up until now, it had just been sitting and waiting to be used. My vision? (1) Paint the dowel black to match the light post; (2) Stain the frame of the chalkboard a darker color; (3) Add a greeting to the chalkboard; and (4) Hang the board on the dowel with chains, like a street sign! But everything was the wrong color (i.e., too pale, too brassy). First, I wanted to paint the hardware (chains and cup hooks) a more antique-y bronze. To make things easier on myself, I screwed the cup hooks into a piece of scrap wood to easily paint each side evenly. Spray painting hardware can be tricky! And my tip for spray painting things like chain (and window screen, for that matter)? Use a DIY-dedicated clip hanger to hold your item and hang from a garden hook while painting! I’m telling you, it makes it SO easy to get in nooks & crannies from all 360 degrees! Once I stained my chalkboard frame, I purchased a perfectly-sized stencil and used liquid chalk to bring my sign to life! When the chalk had tried and I removed the stencil, I then screwed the cup hooks into the dowel and into the top of my chalkboard frame, and used equal lengths of chain between them! Let’s finish up my old-style street sign! And then I added a flying crow to the sign and spiderwebs to my porch behind my creepy Halloween light post! 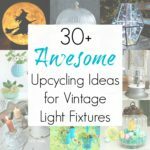 Be sure to check out my full collection of repurposed and upcycled Halloween DIY ideas for more inspiration like this! LOVE, LOVE,LOVE this!! I definitely would have stopped and picked up those candle holders!! You have trained your hubby well!! LOL!! You lucky thing! What a great find, and I’d have snapped them up too. So clever, making the Halloween sign, the bird is the perfect touch!! Such a lucky, love it Sarah!!! Wow, does this look great! Your lamps turned out so cute. Kudos to hubby for finding such a deal. I wouldn’t have thought to use the stencil and liquid chalk, will certainly try it. You always come up with the best ideas for repurposing your finds. This repurpose it one of my favorites. Thanks for sharing at Snickerdoodle! I just love it all so much! Great ideas! He’s pretty wonderful, that’s for sure- thank you so much!!! This turned out so good, Sarah and the flying crow couldn’t be a more fitting embellishment! Your house must look amazing for Halloween. I LOVE your decoration for Halloween! You are creative and talented! So jealous of your cool lamp post. What I great idea to highlight your cool find. Great look and love how you made this great looking vignette with used parts. You have such cute ideas! I’m hoping I can find a similar light post, because I really need to have one of these! You can’t beat free and this is so fun! Thanks for sharing @Vintage Charm! Those posts are awesome! I am green with envy! I love the finished project. I’m planning to make a Halloween wreath that has blackbirds or crows on it. I’m wondering where you found that flying bird on your lamp post. Mind telling? Sounds great, Naomi! I bought that bird at Michael’s last year- not sure if they have them again this year, but definitely worth a look.